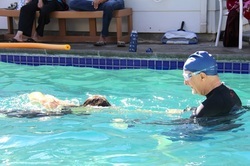 David is offering swimming and therapeutic aquatics training in the Alexander-based Shaw Method. Learn to swim gracefully and pain-free. Steven Shaw, right, in London, 2012. 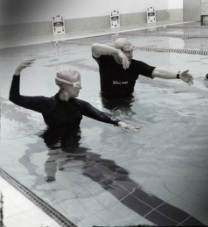 Steven Shaw, left, founder of the Shaw Method, demonstrating fundamentals of the front crawl stroke in New York City. time in the water as enjoyable and productive as possible. Discover how to rid yourself of the neck and shoulder tension and breathing habits that keep you from improving as fast as you can. Discover how easy it is to overcome the fears or pain that keep you away from the water. Discover how to rid yourself of the habits you learned as a competitive swimmer so you can enjoy the water like you did when you were young. Discover how to swim butterfly in a way that is good for your back and shoulders – and doesn't tire you out after just a few laps. Discover the art of swimming! Inquire about David's program for fearful swimmers and beginners. David, at right, will always be in the water with you. Each swimmer will receive lessons in a custom tailored program suited to your needs and desires. Each stroke is broken down into a series of fundamental practices designed to encourage optimal body mechanics during all aspects of the stroke before adding breathing and performing the full stroke. You can choose which of the four strokes you want to learn: front crawl, backstroke, and butterfly. David working with student in Davis, CA. SCUBA instructor and internationally published underwater photographer as well. He found the Alexander Technique after being told by a leading orthopedic surgeon that he should never exercise or do anything strenuous again due to a range of musculoskeletal issues. The Alexander Technique resolved his arm, neck, and back injuries and the Shaw Method of swimming allowed him to engage in frequent and vigorous exercise with ease. Whatever your condition or goal, I will work with you to find more ease and joy in the water. 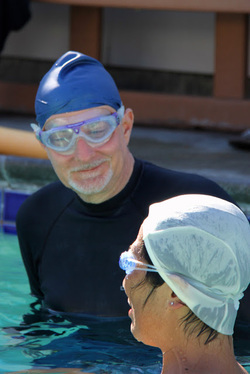 David is a volunteer with SNAP (Special Needs Aquatics Program) at the YMCA in Pala Alto, CA. The special neeeds include autism, cerebral palsy, ADD, and Down's Syndrome. Also Lifeguard certified by the Red Cross.